This DC power jack/connector is just like the other one that we carry except that it's terminated with breadboard-friendly pins instead of wide solder terminals. This DC power jack/connector is just like the other one that we carry except that it's terminated with breadboard-friendly pins instead of wide solder terminals. 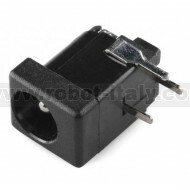 These are also compatible with our DC wall supplies and have a 5mm jack, with a 2.1mm center pole diameter.